I set my trap in the garden next to the spinach and lettuce, piling old sycamore leaves and sliced fruit in a narrow hump, sprinkling it lightly with water and then stretching loose garden netting over top. Early the third morning, before the sun heated things up, I pulled the netting tight so that whatever was underneath couldn’t jump out. The netting held close to two dozen field crickets, enough for at least a couple of hours of fishing. Local bait shops don’t stock crickets, but when fishing in regions where crickets are available, I buy them by the scoop to catch everything from big shellcrackers to redbreasts, flyers, bluegills, crappies and even perch. Then again, if I had the option to catch my own while on the road, I’d probably do it, then, too. It’s kind of fun to catch your own bait. I remember watching a dumb reality TV show on which, to win a prize, the contestant had to sit in a vat of crickets. No wonder I canceled my cable TV years ago. I’ve been happily putting hands in cricket containers since I was a young’un, and my constant reward has been great catches of tasty panfish. A mature field cricket is a fat feast that covers a small hook shank with a broad, dark body while the legs dangle enticingly beneath. Small wonder bull bluegills are suckers for crickets. Like everyone else I know who uses crickets for bait, I keep mine in a screen container about the size of a child’s beach bucket. A plastic sleeve inside the circular container prevents the crickets climbing out. To remove a cricket from the container, simply reach in, lift the circular sleeve if necessary, and then grasp the prize firmly. A few occasionally hop out, but they are disoriented and easy to recapture. Crickets are an easy-to-keep live bait, but it is important that you keep them in a cool, shady place. Leave the container out on the deck of the boat in a blazing sun and the crickets will die. Then those crispy critters are about useless as bait, breaking like cracker crumbs when you try to impale them on a hook. But to avoid this, all you have to do is keep them out of the sun, perhaps in the cockpit or in the shade of a big cooler. A wet cloth laid over the container also helps. To keep crickets for several days at home, you may want to feed them. I just leave a slice of slightly moistened bread in the cage. The crickets walk over it getting moisture and, I assume, some food value. A friend of mine serves his crickets half a peanut butter and grape jelly sandwich. When Matt Outlaw and I were fishing the St. John’s River in Florida, he put half an orange in the container, and the crickets crawled all over it. “They get that orange flavor and scent on them, and the panfish love it,” Outlaw explained. We certainly hammered the redbreasts and shellcrackers with those orange-infused crickets, and after coming home from that trip, I added half an apple to my cricket container and also some squishy grapes. The crickets sat on the fruit, and in the morning the bucket had a nice fresh smell to it. An old canal shadows the Schuylkill River about an hour’s drive from my home, the same river George Washington camped alongside during the winter of 1777-78. The old towpath is now a canal-side trail and a mecca for joggers, bikers and strollers. The canal itself is filled with bluegills, pumpkinseeds and some crappies in a few deep holes. I like to think the canal builders would be pleased to know the number of plump panfish that now live along their hand-laid stone walls. But these fish are as skittish as moths, what with so much foot traffic passing by. They tend to hang back in the weeds, especially during the day. 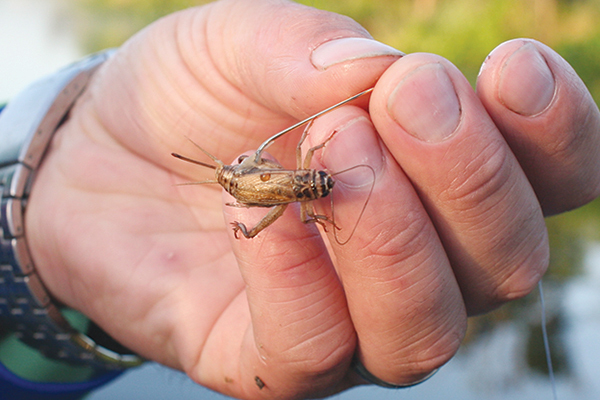 I catch a few fly-fishing, but for the best summer fishing, I depend on those garden crickets. As a kid I just used a cane pole to fish crickets. Nowadays, I prefer a 10-foot graphite rod to lower the crickets into the canal, dangling beneath a slip bobber set with a short leader. The instant that float dips, I set the hook. 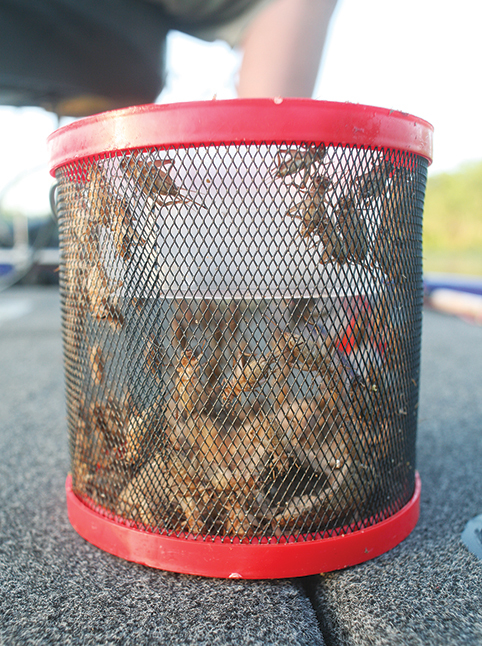 Even when you don’t bring crickets from home, freshly caught can save a tough day on the water. One such July day on the Juniata River in Pennsylvania, back when the rock bass were still plentiful, we couldn’t get anything to take lures or flies. The sun was blazing, so we parked the boat in a shady little cove, climbed the slope and sat in the wooded shade taking a break. As we ate sandwiches and drank our cans of cold birch beer—a Pennsylvania favorite—a field cricket crawled over the end of the decaying log where we sat. With a quick swipe I caught it and dropped it in my empty soda can. We rolled the log and managed to scoop a dozen more from the moist, rotting wood. Crickets are slower than grasshoppers and easy to catch by hand. Alongside the hand tools and spare spark plug in my boat’s emergency box I also keep a smaller box with hooks, bobbers and split shot. We used this tackle and short spinning rods to lob cricket-baited hooks and floats into the shady shallows, and we caught some dandy rock bass beside some large bankside rocks, letting the slow current carry the rigs to the fish. Somewhat copper color of fins and forehead are distinguishing features of the coppernose, along with the considerable size. 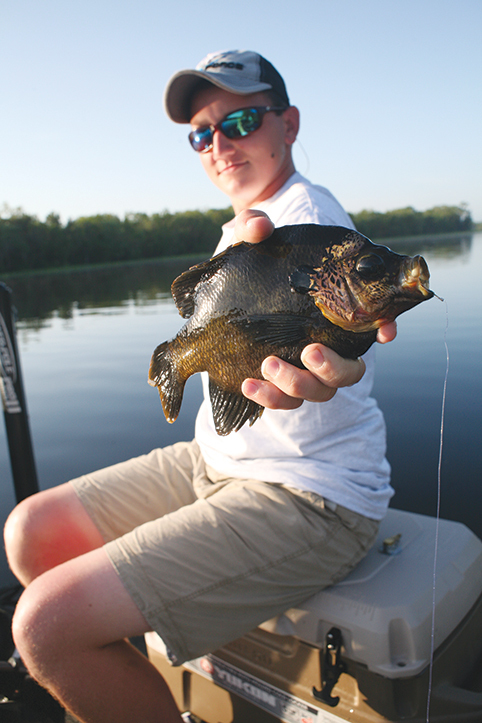 They get much larger than typical Northern bluegill, though that may be due mainly to the longer growing season. Regardless, I’ve caught a couple that topped 2 pounds, and that’s a panfish to remember. Where the fishing pressure takes more of a toll, a coppernose over a pound is considered a great catch. Outlaw brought toothpick floats, bulbous Styrofoam cylinders with a toothpick pegged through the center. To adjust the fishing depth, simply pull the toothpick peg and change the length of line between bobber and bait. He selected a gold No. 4 Tru-Turn with a thin shaft that wouldn’t disembowel the wiggling cricket while he threaded it on the hook. “I like No. 4 hooks for the small mouth of the bream,” Outlaw explained. All bluegill are called bream down South. Split shot about 4 inches above the hook made sure crickets would quickly sink below the surface pads. The trick, here, is to use as little weight as is necessary but enough to drop a cricket through the tangle of lily stalks. If a float didn’t stand up, an indication the bait was being held up, we might add an additional shot to pull it down and through. Outlaw directed me to work the openings in the outer rim of lily pads, next to the channel where the bluegills feed in the morning and again in the evening. Along that rim, the water was about 4 feet deep though it was much shallower closer to the bank. With his 12-foot poles, we could reach out from the boat and lower baits directly into all of this water, not having to disturb the fish. When fishing with these long poles the reel rarely if ever comes into play, serving more for line storage that anything else. To relieve the stress on the long rod’s thin tip, after feeding line through the top guide he spiraled it down around the rod about 20 times and tied it off on the second guide. Outlaw let the current carry us alongside the pad edges and craggy banks, using the trolling motor and Power Pole to slow or stop us to work particularly promising holes. In addition to pad openings, we worked the underwater logs and indents in the shoreline. The deeper inlets proved particularly good. We held the rod tips no more than 6 inches above the water. When a float dipped, a quick lift set the hook and then we kept lifting the fish up and out of the water. In such thick cover, it’s imperative to gain immediate control over such powerful panfish. Given even a second, they will wrap the line around submerged snags. In addition to the coppernose, we also caught warmouth, which may be the darkest of all the bluegill-like fish, and redbreast sunfish, one of the most colorful. For all of these panfish and more, crickets provide a dandy summer offering, one that rarely fails.